This is the village overview. It is where the resource tiles are located; you can expand (upgrade) them in order to increase production. Right now, you have absolutely no upgraded resource tiles; this means, they are producing the very core minimum, which you will need to increase later on as your village grows. Before we begin, let’s take some time to learn more information about the overview and its resources. Box 1: This is the list of the resources you currently have stored in your village (the number shown on the left), and the total amount your storage can hold (the number shown on the right). You can’t have more than the amount you can hold, and it is not recommended that you allow your resources to fill up, because that would cause an overflow or a waste of resources. The small bars beneath the numbers will be green in color if you are safe from overflowing, but will become red once your resources begin getting wasted. All the way to the right, there is a small image of wheat with a red cross over it. That is your crop consumption. Crop consumption is the total amount of crop consumed by your villagers and troops; the amount of crop consumed is the number shown to the left. 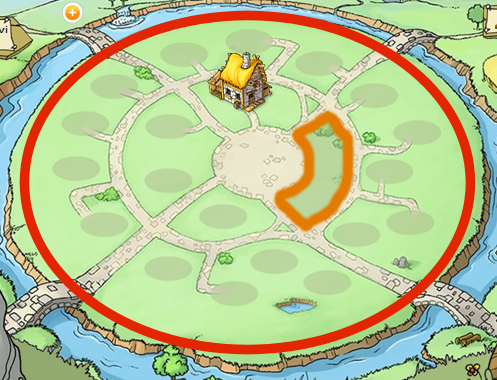 The total production of crop in your village (or the maximal amount of troops and villagers you can feed without having to upgrade crop production) is shown on the right. Troops and population eat crop; that means that if you’re producing 12 wheat per hour, it will only show you that you are making 10 wheat per hour, because 2 of the wheat is being consumed as food. Currently, you don’t have an army, so you’ll have to worry about troops and their crop consumption later. The number next to the 2 is the maximum amount of people your tiny village can feed, and it will stay that small until you increase it by upgrading your crop fields. Box 2: This is the main overview of all of your resource tiles. As your village grows, you will need to upgrade these tiles, to increase production. Right now, it is pretty much empty and will remain empty until you start building up. Remember; these resource tiles are a way for you to build up a strong economy. No village can function without them. 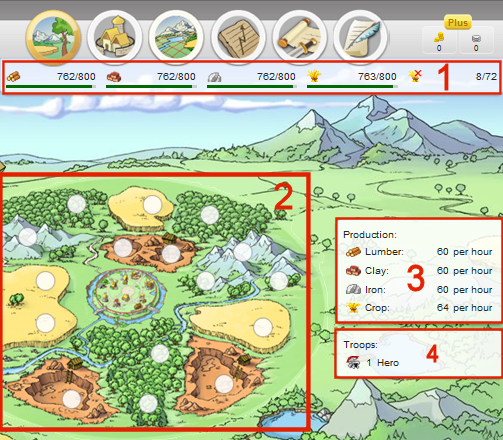 In Travian, there are four resources to be produced: crop (also called wheat), lumber, iron, and clay. All four are important, but crop is something you should always have plenty of, since you will need more of it the more people and soldiers you have in your village. Also, some resources are more valuable to certain tribes. Gauls, for instance, need a lot of clay. Romans need a lot of iron, and Teutons require an abundance of wood.